Smile is a Fletcher-Munson based de-harsher. Smile use the knowledge of the Fletcher-Munson phenomena to de-harsh audio and adapt the frequency response to the human hearing. With the help of a transient recovery engine you can push it pretty hard before it start to sound dull and we included a filter to handle the extremes in the low and hi-end from the Fletcher-Munson curve. In the donation version you’re able to fine tune the transients with the new, more musical, transient engine. 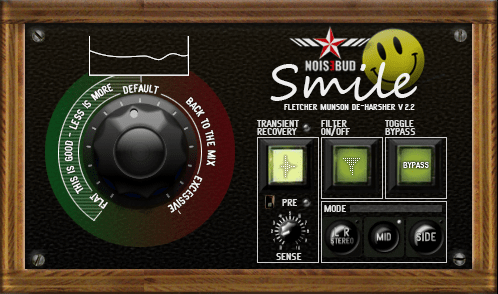 In short, Smile is a Fletcher-Munson based de-harsher.